We offer a variety of services for your commercial needs. We also offer a limited scope services for residential customers as well. Contact us to get more details. We know lawns. From clearing land and initial installations to the weekly and annual upkeep. For commercial customers, we can help with spring lawn care (thatching, aerating, and fertilizing) as well as routine grass cutting on a predetermined schedule. Worry Free offers landscaping services to both residential and commerical customers. We specialize in retaining walls, walking paths, land clearing, dirt grading, and new lawn installations. In addition to our other commerical services, we can blow off or sweep your driveway, sidewalk, or parking lot. We can also gather up and haul the gravel that accumulated during the winter. Don't see what you're looking for? Contact us to see if we can help. We can help during the winter too! Our great service doesn't stop when the snow flies. We can provide you with our snow management services. See our winter services for more information. 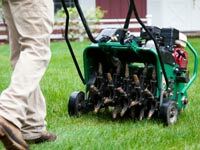 Proper lawn care in Alaska begins with spring time aeration, thatching, and fertilizing. We are effecient and experienced at helping your lawn get the start it needs.